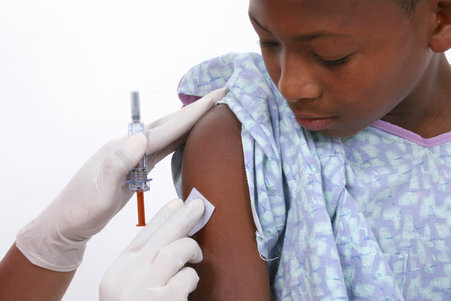 Getting a vaccine can be a painful experience, especially when you’re a kid. But getting told the shot might “hurt a bit” could actually make it worse. Kalina Michalska, a developmental neuroscientist at the University of California, Riverside. She led a study to find out. The study included 25 adults and 48 children. And 27 of the kids had a pre-existing anxiety disorder. Because medical procedures make pretty much all kids anxious…and those who are anxious to start with tend to find the experience even more painful. The researchers used a handheld wand to apply heat to the forearm of each participant. And they asked subjects to rate the temperature in terms of discomfort. The hottest setting was about the temperature of very warm tap water—uncomfortable, perhaps, but not damaging. But during the experiment, we were most interested in only one temperature: the one that each subject rated as medium. That’s where the “anticipation” part of the experiment comes in. Subjects were played one of two tones. Or at least that’s how it should have felt. But what happened was that subjects reported feeling what they thought they would. “This is really important because it kind of reinforces the necessity of not hyping up painful experiences. And also discouraging children from ramping up the experience in their head." And the same, it seems, goes for the grownups. Next up, Michalska says she’d like to examine whether negative associations can be unlearned. So next time you need a shot, remember: if you think it won’t be so bad, maybe it won’t be.